December: the month when, if you start work at eight and finish at four, you never see daylight. The biggest event this month (?) is the launch of expedition 46 to the International Space Station, with British astronaut Tim Peake on board, scheduled for the 15th. He will fly in a Russian Soyuz and these reliable machines dock with the station almost immediately so the chances of spotting it are remote – but it will still be worth checking heavens-above.com, just in case. The 3rd should see the launch of a Cygnus re-supply vessel to the ISS. This is a huge, very shiny craft carrying two and a half tons of supplies, so should be easy to spot – but only if it’s in the right place at the right time. If you enjoy seeing “shooting stars”, then December brings a double treat. The 14th is the peak of the Gemini meteor shower and the 22nd is when the Ursid shower peaks. With new Moon on the 11th, the Geminids should put on a good show but the Ursids will have to battle a nearly full Moon. As ever, the place to look is the darkest bit of sky you can find, which is usually overhead. Interestingly, full Moon is on Christmas Day this year so the snow-covered rooftops should be well illuminated for anyone wanting to land there. December also brings one of the loveliest sights of the night sky. The Pleiades or Seven Sisters is becoming more visible now and will be with us throughout the winter. Look to the south-east from about seven in the evening and this little misty patch will soon attract your attention. Keep looking as your eyes gradually adapt to the dark and you will see at least six bright, bluish stars appear. Eventually you will see that they sit in a little cloud and perhaps a few more stars will become visible. This is a great target for binoculars or a small telescope. At a distance of about four hundred light years, these are very young stars, possibly only a hundred million years old. Blue in colour because of their very high temperature, they may burn out in only another two hundred million years or so. The gas surrounding them was thought to be left over from their formation but present thinking is that they just happened to blunder into it as they travel through space at about 20 miles a second. Speaking of thinking, I often attend a scientific discussion group of a Friday evening and one of the hot topics recently was the possible signs of an alien civilisation on a distant planet. The planet has been discovered orbiting a distant star (known as KIC 8462852) but there is something odd about the way the star’s light varies, maybe because of a giant alien structure. So where is it in our sky? 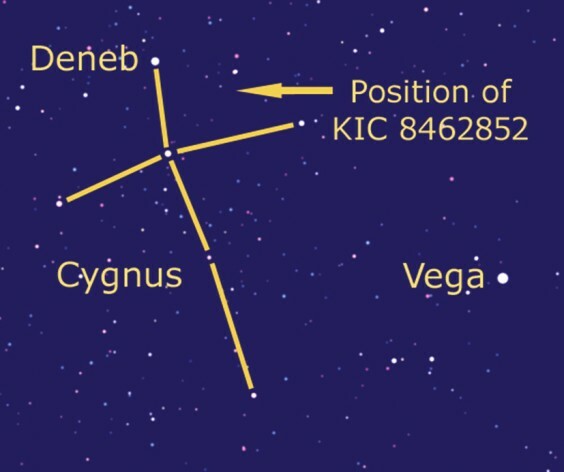 Over in the south west, you should easily find that well-known cross of stars making Cygnus the Swan. Roughly half way between the top of the cross and the right-hand star is where it lies, but you need a decent-sized telescope to see the star. Amazing to think there may be alien life out there. Or perhaps they’re already here – have you seen the morris men on New Year’s Day?